Jaws broke out onto movie theaters in 1975, and with it instilled a fear of going into the water. The movie was the first bonafide Summer Blockbuster, and pushed Steven Spielberg into the spotlight. The movie raked in $7 million dollars in it’s first weekend, and earned back it’s budget within two weeks. That was something that was unheard of, and so was the fact it broke $100 million dollars. It was the first film to break the box office, and remained the box office champ until 1977 when a little film called Star Wars opened. Naturally, Universal wanted another sequel, and began talking about making one soon after the money started rolling in for the first JAWS. Spielberg naturally declined, and the studio sought other writers and directors. There was a point that Spielberg wanted to come back for the sequel, with characters based on Quint’s Indianapolis story, but he was already involved with shooting Close Encounters and would be another year before he would be able to start production. Universal pushed ahead with the film, which went through massive rewrites and reshoots before landing on the version we have today. June 16th, 1978, the movie opened to much fanfare and went on to have the highest grossing opening day ever, with $3.5 million, and a huge weekend with about $9.8 million. It opened on the same weekend as Grease, and still beat it out by less than $1 million. While the film would eventually make over $100 million, it was much less than the roughly $300 million worldwide of the first film. It wasn’t a flop, not by any means, in fact it was the most successful sequel up until that point. But on a budget of $30 million dollars, it wasn’t the runaway success that Universal had hoped for. Of course, any respect the JAWS name had would go out the window with the subsequent two sequels, JAWS 3D and JAWS: The Revenge. With the success of the first JAWS, the Backlot Studio Tour at Universal Studios Hollywood rolled out the JAWS tram stop, in which an animatronic shark attacked the tram. The stop is still there, and is still a fan favorite. 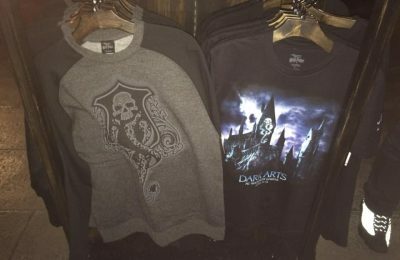 When the development of Universal Studios Florida came about, execs looked to the Studio Tour for inspiration. They wanted to give some of the same experiences that the Hollywood Park did, but instead of using them as tram stops, they wanted full version rides. JAWS was naturally on that list. The park used inspiration from both movies for the ride, in the first iteration. 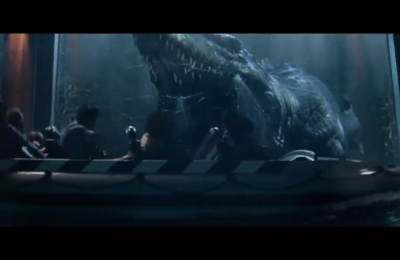 The ride would use the explosion ending from the first film to destroy the shark in an amazing effect. However, the second film provided the biggest inspiration, when the shark latched onto the helicopter and drug it under. The ride had the shark latch onto the tour boats and drag them around the lake, before letting go and coming back for the finale. The ride never really worked, and it was famously closed almost immediately after opening. The company that built the ride never really waterproofed the sharks, and there were always issues. 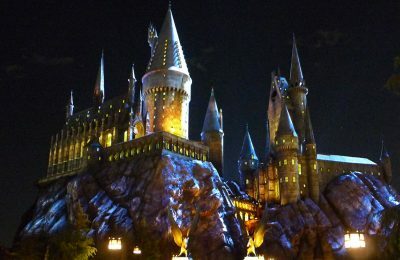 The company was sued by Universal, and eventually scrapped the attraction, to make an all new version. The biggest issues were with the rotating shark turntable, and the explosion ending. But what would make for a great replacement scene, while staying true to the movie at the same time? Enter JAWS 2. The shark biting the boat was replaced by an exploding gas dock, that was triggered by a skipper firing his grenade launcher at the shark and missing. Then, you had to hurry across the burning water and had the shark waiting for you at the end by an electrical barge, where you’re to be unloaded. This was inspired by “Cable Junction” from the film. Then, just as you’re about to get off, the boat is attacked yet again by the shark, and is fried when he bites into a cable in the water, just like the second film. The fried carcass makes one last leap before you “Call off the Marines” and head home. While the ride is inspired by the entire film series, it also feels the entire story of the second iteration of the ride is inspired by the more relaxed feel of the second film. While there are definitely some intense moments in the film, and some of the best cinematography that is often over looked, the spirit and feel of the film is definitely more playful due to the kids being the stars of the film this go round. Of course, Brody is there to save the day and bring the movie some ground, but it’s that more youthful and joyous feeling that really has you attached to the movie. That feeling spills over into the ride, as you tour on Captain Jake’s Amity Boat Tours. They are the best!…and only boat tour on Amity Island. They also keep that super playful spirit alive in the queue, as Chompy, Captain Jake and the rest of the WJWS 13 (The station that bites!) just have a blast bringing faux reports and talk shows to life. Sadly, the ride closed in 2012 to make room for The Wizarding World of Harry Potter: Diagon Alley. The ride does still live on at Universal Japan. JAWS 2 wasn’t the powerhouse that the first film was, and it was more about grabbing a dollar than continuing the story, but it did help build the empire that is Universal Theme Parks. Without the story and visuals of the film, there would have been no ride. The ride helped Universal begin their tradition of “riding the movies” with attractions like JAWS and Kongfrontation, but JAWS was the one that held on longer and made the biggest impression. While the ride itself was almost 20 years old, it never felt dated. The queue might have, but not the ride itself. 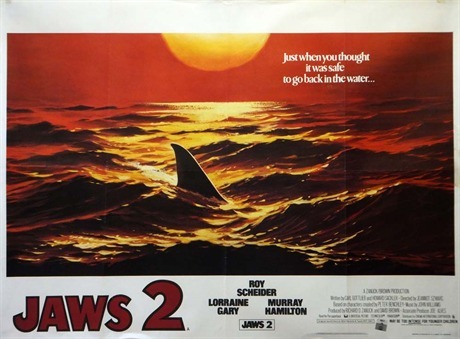 JAWS 2 does take us back to Amity Island, and keeps us up to date with the Brody’s, and making us care about it, something that the next sequels have a hard time doing. The next few chapters in the story, while still fun, do tend to take the legacy of JAWS and make a joke of it. So Happy Birthday JAWS 2, you weren’t as great as your big brother but you weren’t as bad as you could have been either.